The length and breadth of the films, and its types, that is available in Malaysia, is not something that we should turn our noses up at. That is not to say that ‘Punggok Rindukan Bulan’ would have been something that would have been enjoyed up and down the country by everyone. Indeed, even before the very beginning, I had been able to predict roughly at the kind of film that ‘Punggok’ is, and the reception that it would receive upon its release. Then again, to say both implies that there were merely two factors worth considering when it comes to my expectation. There is a third, and more unexpected one: its emotional impact. Though it comes and goes (and flirted very dangerously with the border of Boredomville), it is there nonetheless. I will elaborate upon this further once I have explained the plot, and its slight ‘madness’. "Want to meet Uncle Hussein?" We follow the trials and tribulations of a young boy named Sidi (Saeful Nazhif Satria). He is the son of Adman (Sahronizam Noor), and they both live in a low cost flat in Johor Bahru. Their lives seems like one of a pointless existence, with Sidi spending most of his days roaming around and getting up to the normal sort of things that boys his age would get up to. When time permits, his grandparents would come over and spend some time looking after him, coming by once in a while to cook for him. All of this are apparent after effects of having an absent mother figure, Umi (Maya Karin), who left them early on in the film. It is the lack of her presence that is intended to dominate the film. I say intended, because personally, as I watched the film, I came to revel in the beauty of some of the shots (including a weird ‘Vertigo’ shot that totally caught me off guard in a very pleasant way). There is a certain, almost indescribable quality to them. Almost, because I’m going to try anyway. You know when you have seen something in a single place for a long time? It’s just there, not really doing anything special besides being there. And then one day, it’s gone. If it is a frame on a wall, it leaves behind a mark indicating its previous residence: subtle, but sure. The roadsigns in JB are confusing. Now imagine that you’ve just moved into a new house. Not brand new, but purchased. Second-hand, perhaps. Or maybe even you rented the place out for you and your two friends. It was an experience that I went through, and during the earliest days, I spent some time thinking and wondering about the sort of lives that went on before my arrival. People have had significant moments in that place. And yet, now there is nothing left of that moment but an empty space that is waiting to be filled by late night Defence of the Ancients sessions. I believe this is the sort of quality that Azharr was trying to portray on the big screen. His decision to shoot at the Bukit Chagar Flats was a deliberate one, given that it was scheduled for demolition soon after the shooting itself. In that regard, this film not only serves as a ‘Flower in the Pocket II’ (child, father, absent mother, and all that jazz). It also serves as an attempt to preserve and to pay homage to a building that has been standing tall for a long time. It is, however, not an easy trick to attempt, and one that can easily be lost. It is certainly lost on the two Korean women who were poring over the Pusan festival programme book, trying to reclaim the meaning of the film. The father-son gangster team is going well. This is even more so after the appearance of Sharifah Amani’s character, Riza. I should point out, however, that the version released in the cinemas in Malaysia did not have her in it. Rather, it seemed like it was added on, almost as an afterthought, serving almost as an epilogue to the proceedings. In stark contrast to Sidi (who had lived there continuously for a long time), hers is a character who returned to the flats after having spent a long time away from it. She spends her time, poring over the same surfaces as Sidi did, taking pictures, and, once again, looking out longingly from the high-rise building. It would have been a lot more comfortably for me had there been a clearer link between her and Sidi; instead, this part felt, from my point of view, more than a little disjointed. It is as if the main character of the film changed, suddenly, almost without warning, and we are forced to shift not only our logical train of thought, but also our emotional attachment to the previous characters. Actually, I should say ‘as if’, for that is exactly what happened, as it happened, when it happened, and how it happened. That’s not to say that you won’t get it. It’s just that you probably will get lost along the way. Azharr doesn’t really intend on making it easy or conventional for you. Take, for example, the scene of Sidi fishing with his father. It was incredibly dark, incredibly raw, and for me, incredibly brave of him to shoot it with the most minimum of lights. You can hardly see anything in the long shots of the two of them. And yet, for me, that remains one of the best scenes, one in which I find myself being drawn in, rather than turned off, by the film. Fikri has been reliably informed that cats do indeed have shoulders. You can read our interview with Azhar about this film, his other works, and more here. 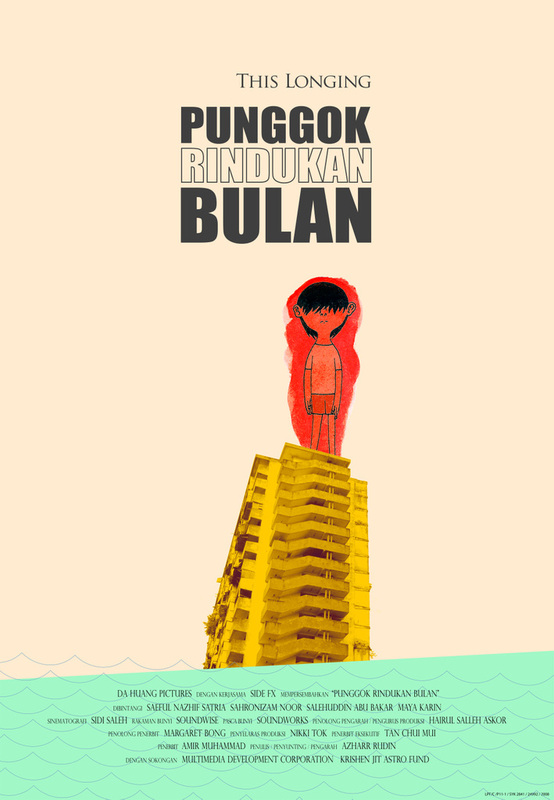 I first wrote about ‘Punggok’ here.